If your deposit was not enough to cover your entire down payment you will be expected to provide the rest of the down payment at move-in time. Real Estate commissions are paid by the seller, so you have no cost for this. 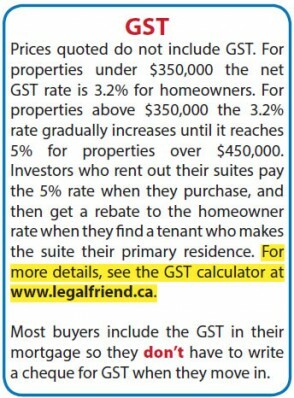 New properties have a sales tax called GST; this should have been added to the price before the mortgage was obtained so that no funds are needed for this tax at the time of possession if you have a mortgage. When you arrange your mortgage loan, discuss having the GST included in the mortgage amount with your lender. For properties under $350,000, the net GST rate is 3.2% for homeowners. For properties over $450,000 the rate is 5%. Properties between $350,000 and $450,000 pay on a sliding scale. If you have less than 20% down you will have mortgage insurance (about 3-4% of your mortgage). This premium will be added on top of your mortgage once at the beginning, so you do not have to pay this premium in cash at possession time. In BC there is a sales tax on property called the Property Transfer Tax (PTT). This tax does not apply to NEW residences under $750,000 (and partially applies to NEW residences between $750,00 and $800,000) when used as a primary residence by Canadian buyers or permanent residents. The tax does apply to all used homes and new homes over $800,000. For example the PTT on a used $750,000 property is $13,000. Because Forest Ridge is new, our buyers can take advantage of this savings. Your bank may have an appraisal fee to be paid when you buy, but most lenders will waive this fee. If they don’t it is often about $300. Your lawyer will charge you legal fees to handle your share of legal work for the purchase, these fees are often about $900 and must be paid when you take possession. There may be property tax adjustment of a few hundred dollars when you move in, depending on the time of year that you take possession. [Sometimes your bank will pay part of these closing fees as a gift to you for using them for your mortgage]. Sometimes utilities will charge you a fee of $50 to $70 to hook up power for the first time. The fire/water/flood/earthquake insurance your mortgage company requires is already provided by your strata corporation. You do not need to purchase more insurance if you don’t want to. The included insurance does not include your contents or personal liability. We recommend buyers purchase additional contents and personal liability insurance. Finally, there is often the added cost of a moving van to move your possessions in.